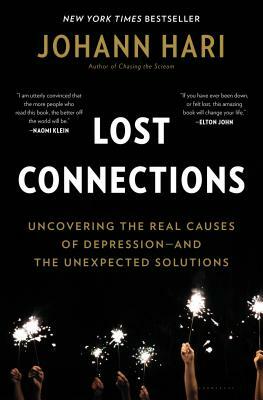 Lost Connections is the perfect read for anyone who is currently being medicated on pharmaceuticals for depression or anxiety. Johann Hari gets to the bottom of how our mental health is treated today and how we are actually lied to on the use of pharmaceuticals to heal these issues. In fact, multiple studies which he sites show that a good night’s sleep has a greater impact on depression than a pharmaceutical grade antidepressant. The rest of the book covers how to actually heal these issues through means that are actually effective. These solutions include rebuilding a community, providing emotional and trauma support for those who need it, and to change certain things about diet. Do yourself a favor and pick this book up if you’re trying to heal yourself emotionally in a lasting manner. The New York Times bestseller from the author of Chasing the Scream, offering a radical new way of thinking about depression and anxiety. There was a mystery haunting award-winning investigative journalist Johann Hari. He was thirty-nine years old, and almost every year he had been alive, depression and anxiety had increased in Britain and across the Western world. Why? He had a very personal reason to ask this question. When he was a teenager, he had gone to his doctor and explained that he felt like pain was leaking out of him, and he couldn’t control it or understand it. Some of the solutions his doctor offered had given him some relief—but he remained in deep pain. So, as an adult, he went on a forty-thousand-mile journey across the world to interview the leading experts about what causes depression and anxiety, and what solves them. He learned there is scientific evidence for nine different causes of depression and anxiety—and that this knowledge leads to a very different set of solutions: ones that offer real hope. Johann Hari is the New York Times bestselling author of Chasing the Scream, which is being adapted into a feature film. He was twice named Newspaper Journalist of the Year by Amnesty International UK. He has written for the New York Times, the Los Angeles Times, and others, and he is a regular panelist on HBO's Real Time with Bill Maher. His TED talk, “Everything You Think You Know About Addiction Is Wrong,” has more than 20 million views. "Eye-opening, highly detailed . . . The book is part personal odyssey, in which Hari gets to grips with the flaws in his own treatment, and part scholarly reflection, where he sifts through the varying perspectives of scientists, psychologists and people with depression . . . Hari is clear about the difficulties of the task ahead and, in offering new ways of thinking, presents not surefire solutions but, he says, 'an alternative direction of travel' . . . A compassionate, common-sense approach to depression and anxiety . . . His book brings with it an urgency and rigour that will, with luck, encourage the authorities to sit up and take note." - Guardian, "Book of the Day, 17 January 2018"